Planning a wedding can be difficult, but choosing a wedding band does not have to be! 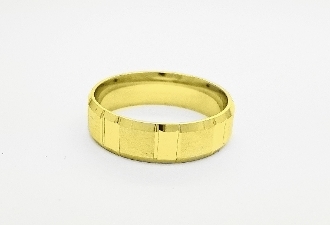 These 14k gold rings feature an interchanging rectangular square pattern which is visually appealing and sophisticated. The rings have a high gloss and matte finish which is a perfect match for everyone’s taste! Add your own personalized touch by choosing the engrave option. These bands are available in both his & hers sizes!